Who does not know the menu on this one? The menu is typical of Indonesia it was quite favored by foreign tourists to visit Indonesia. Fried rice is usually to be found in roadside stalls, even many mothers who are accustomed to making home style fried rice dishes. Mix rice, coupled with the egg scrambled and then mixed with various spices to make fried rice became the Favorites of many. Not just in a small roadside stall or fried rice ala home, Restaurant starred else often incorporate the list into specialty fried rice and their favorite tables! So there's no need to wonder if Barack Obama (American President), Shahrukh Khan (famous Bollywood Movie Player), such international singer Katy Perry, Super Junior (Boyband that had worldwide), L'Arc-en-Ciel (Japan Band), and also Lee min ho fall hearts when they first taste the flavor of the fried rice. 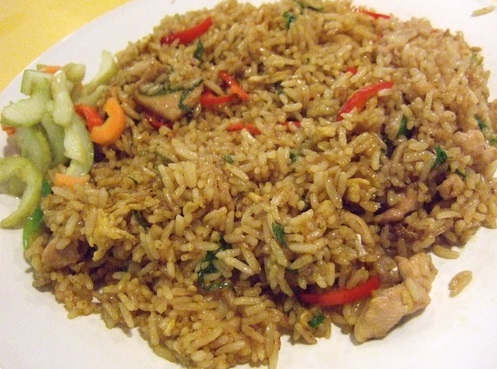 Then apasih that makes the foreigners were so crazy about fried rice is that? As it turns out, as there are a variety of seasonings are blended in this fried rice that did not exist in their country of origin. Like Chili, and a variety of other spices. In fact, the spicy fried rice seasoning, the more the foreigners it ask for Add. Wah, wah, really well turned out incredible charm of this fried rice was not surprised if fried rice terenak food occupies number 2 version of CNN in 2011.